A lot of hard work, endless cups of coffee / tea (with biscuits of course)! 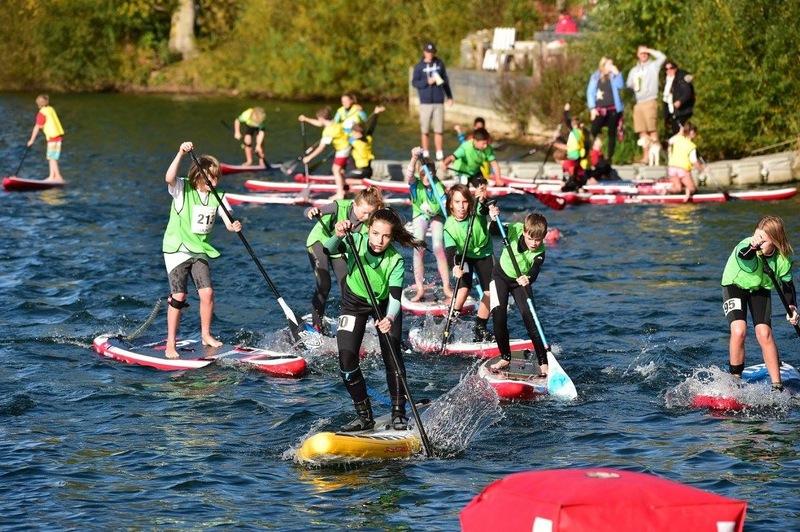 On the 30th September, 224 paddlers took part in the British SUP Club Championships at Bray Lake Watersports making it the biggest competitive paddle board race in the UK. Now in its 5th year, the Club Championships have shown to be one of the most popular events, with participant and clubs consistently growing year on year. This year saw 16 clubs from around the UK including 6 attending for the first time, descend on Bray Lake with paddlers aged from 5 to 70 years old. Below is a guide listing the top 10 items to think about when putting on an event of this size. The key thing to remember, is that you are delivering a service and you need to keep in the back of your mind, what would you expect? This may seem strange to say, however people are paying to attend and you need to deliver the event seamlessly. Whatever time you think you need, double it, if not triple it! The Club Champs takes around 9 months of work to put on and requires a lot of attention to detail and effective project management. This is to ensure no items are forgotten, dates are not missed and information is available on time. There are also a lot of inter-dependencies between items, meaning it is important to get them all sorted in good time. A number of documents were produced from the beginning and maintained throughout, which included roles and responsibilities along with the schedule. All results sheets (one per race, 10 in total), whether that is for recording who is coming over the line or for the category prizes or the overall positions are created in advance and printed out for the day. Every volunteer is also given a paper copy of the schedule in addition to it being emailed out in advance. For the schedule you need to decide on the categories and to ensure you have time for everything. Expect to re-do this a number of times. If you have a set format, then it may be possible to use details from the previous year however with the Club Champs this had to be re-done in the final week. You also need a number of different versions – one for the paddlers containing the high level detail and one for the volunteers, broken to potentially to every 5-10mins with names against each item. To help Clubs plan their training, we produced packs detailing the categories and format for the day which was sent out in April. This took a number of different versions based many conversations with Sam & Simon over the course of many weeks, keeping a close eye on the detail to ensure nothing was missed out. It is important that information is shared early to allow Clubs and paddlers to read through, particularly when there are lots of categories. I was also regularly in touch via email to update the Team Captains as well as chasing via social media messages to either get teams registered or answering queries. You also need to be available via the phone to answer questions from the Team Captains – particularly for new clubs. Club registration packs containing bib numbers, pins, team sheets can’t be forgotten either. This year a dedicated email address was set up to help communicate with each of the clubs and over the course of the build-up lots of emails were sent – 200 in Sept alone over. Having a dedicated account allows those looking after the organising of the event to receive the communication directly – however remember, you are still delivering a service meaning any emails should be swiftly responded to. Even if it is a case of “we will get back to you soon”. In addition, you cannot forget social media and for the Club Champs you can find this on Facebook. This means providing regular updates, responding to messages from paddlers at all times of the day (remember you are delivering a services) and using it as a way of communicating to paddlers. Ideally you need a couple of people to share this responsibility and using the ability to schedule posts is a great way to save time. With any event, keeping registration as simple as possible not only helps the organisers but also those attending. Paddlers are also keen to know their times and having the correct tools (plus backups) in place is critical. This year, we used a tool called Webscorer which allows you to create a registration form that can be linked into Paypal (or other payment systems) to capture the information you need. The benefit of this is the data is then already available in the tool for timing the race and it allows you to automatically assign bib numbers, plus lots more. When creating your registration form, think about what information you need to capture (name, contact details, which category the person wishes to enter etc), any additional information you need (e.g. BBQ tickets) along with terms & conditions and confirmation emails. All need testing and validating before going live. The other key benefit is the ability to use multiple devices as once you get over a certain number of paddlers you need bib numbers. It also allows you to export the data already split by categories, which on the day saved valuable time. For the Club Champs we used 2 phones, 2 ipads and 1 laptop for the main races and had a big battery thanks Paul Simmons from Tushingham to power everything. If you are using a timing app for the first time, make sure you test this out numerous times so you know how it works and how to make alterations etc. For the Club Champs, I was lucky to be able to use the Bray Lake Watersports Summer Race Series to test the app and even then there were things I was discovering each month. Don’t forgot you also need a paper back up just in case! All paddlers want to know the course they are racing in advance and ideally you should have a picture with a description along with a video (if possible). This was the first year I got involved in designing the courses, which meant editing photos via paint on the laptop to tidy them up and adding and removing buoys etc. This took a lot of time as 6 course routes were required and lots of versions. You also need contingency plans for courses in case the reliable British weather changes and to review the layout with those who will be moving buoys around on the day. If you do not publish, expect social media messages! The event cannot run without them! As part of the planning you need to work out how many people you need and more importantly find out if they are taking part in the race or not. This will dictate when they will be able to help. For recording the results, we had a min of 3 people per race – two using devices and one doing paper based backup. These people altered per race, so in total there were 12 people giving up their time over the course of the day. It is key that those helping have practiced using the app and know what their role is. The other vital bit is that the results team are left alone to focus on taking the results, which means not being disturbed by well-intentioned paddlers. If they are not, errors can happen (wrong bib numbers written down, paddlers missed, timings missed) which then cause a lot of headaches and time to resolve. As the Club Champs results are based on points, as soon as the first race is over I am then working out points for every category so unable to help take results. For the Junior Club Championships which run along-side the main event, we had Sam Barfield, Louise Broda and Jamie Harman from Red Paddle all give up their time. You also need volunteers to help before the event – as well as myself, there were 3 other people (thank you Candice, Sam and Louise) onsite the day before writing up white boards with information, putting medals & trophies together, finishing off team packs, helping sort the catering and lots more. This was truly down to Andy at Bray Lake, who made it work fantastically….even after we increased the numbers. Things to think about: safety – safety boats, and boat drivers and first aid cover; course layout – setting up buoys, moving them during the course; car parking – how many can you fit on site, line painting so people park correctly, having car park attendants (volunteers); camping – how many people can we fit on site, how many, tents and vans and dealing with the various sizes, trimming back bushes and cutting the grass, portaloos; site security – more volunteers; catering – breakfast, lunch and dinner, hot/cold drinks for the day…we had over 500 bread rolls in! Staffing for the day….some people might not realise that during the Club Champs, Bray Lake stays open! Meaning we need people covering reception to handle queries, questions and cover the shop. Do not under estimate the time you need to give to putting on an event like this – I think it is probably safe to say I’ve put in around 150hrs over the 9mths. It involves giving up evenings and weekends as well as driving friends crazy as your focus is on organising the event, while they are out paddling! I spent the weekend before the Club Champs pulling the team packs together and had already spent time putting pins in envelopes, producing sprint heats (which had to be re-done at least 3 times due to changes), re-doing course routes and lots more. Then Wednesday evening, half day Thursday and taking annual leave from work to spend all day on site on the Friday. Each year we aims to give out as many medals and trophies as possible and to keep their design fresh and different and remembering to cover all the categories being raced. For this, you need to have confirmed the categories as these will dictate the number you need so by necessity it can often be a bit last minute before we confirm the final number. I think we went through the list at least 3 or 4 times in the build-up and probably more. You need a min of 3 people per category to run it, which for this year’s Club Champs meant dropping Men’s 51+ technical and Women’s Crossover. This year we had 60 trophies and 162 medals. We are lucky to get support from the industry with Fanatic, Starboard, Red Paddle Co, Black Project, Sunnto, Palm helping us in many way including sponsorship of individual races. This year we also reached out to brands outside of the sport and were able to get support from Can O Water and Mcvities who donated some of their products for then paddlers. The day starts early with all volunteers being on site from 06:30 to set up and to check nothing has changed overnight. From this point, it is full on following the schedule to ensure the day runs smoothly and does not stop until after the main prize giving. For me, this meant stopping at around 18:30 and finding a beer along with some food! I hope you have found this a useful insight….roll on 2018!